I rarely use a pattern to piece a quilt. I prefer to see the design in a photo or sketch and come up with my own dimensions and piecing steps. Very often I piece a quilt block backwards. 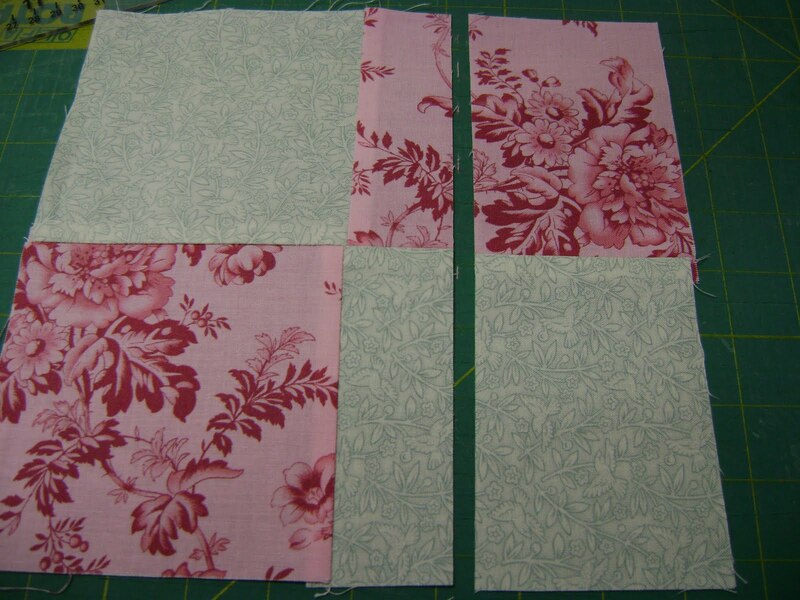 I start with a square; then, using a series of cutting and resewing, the pieced block emerges. I would appreciate comments from anyone who decides to create this quilt using my backwards technique. Is it helpful? Would you want to see more backwards quilts? Did it help your accuracy? Will you donate your quilt or give it to someone special. How long did it take? Was it faster or slower than your normal piecing? That sort of thing. 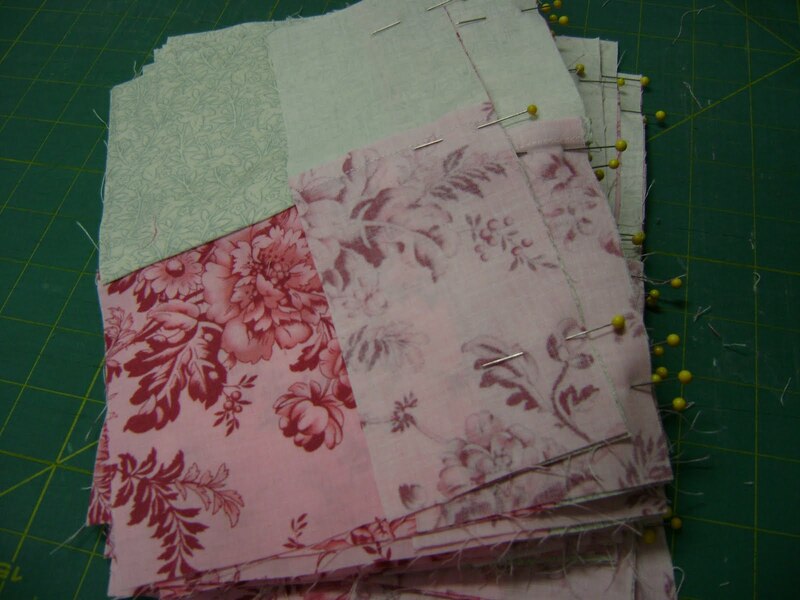 The photo I saw was from the magazine Fabric Trends for Quilters, Spring 2008 issue, page 44, a design called Opposites Attract, by Kathy Brown for Troy Corp.
Kathy Brown gives cutting and piecing instructions to create twelve 18″ blocks which make a quilt that’s 70 x 88. As soon as I saw the picture I knew I wanted to make one of these but only much smaller. A smaller size would work to satisfy my craving to make this design, would give me a finished charity quilt, and could be done backwards very quickly. I’m putting the instructions here so you can try out my technique yourself. 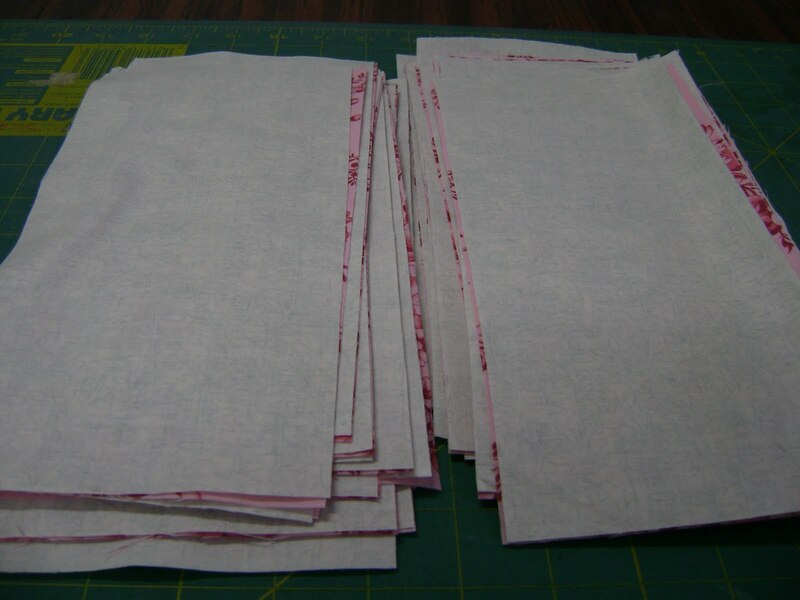 I started with 30 squares of fabric. All are cut 10″ square. There are 15 light and 15 dark. 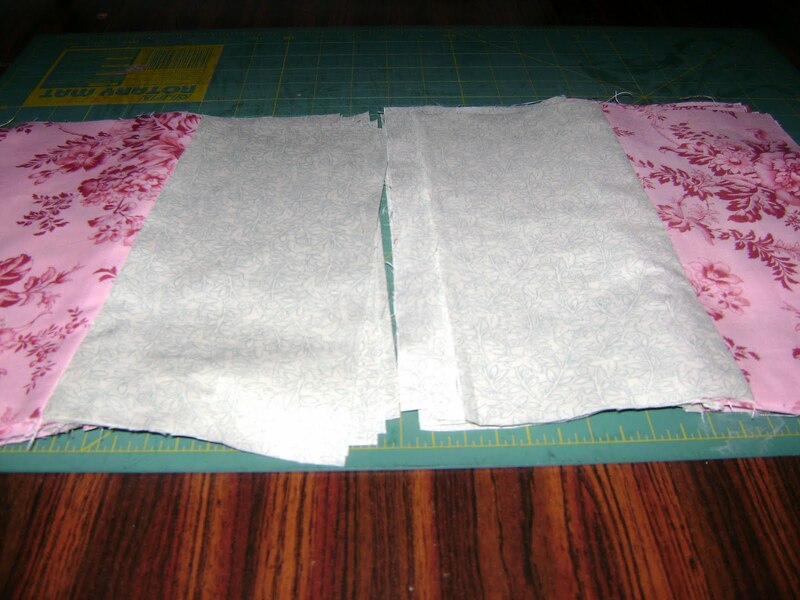 Start by paring up one light with one dark fabric, right sides together. You will have a stack of 15 pairs. Cut these in half right down the middle of each pair. Pin the halves together and sew. You should then press the seam toward the darker side. 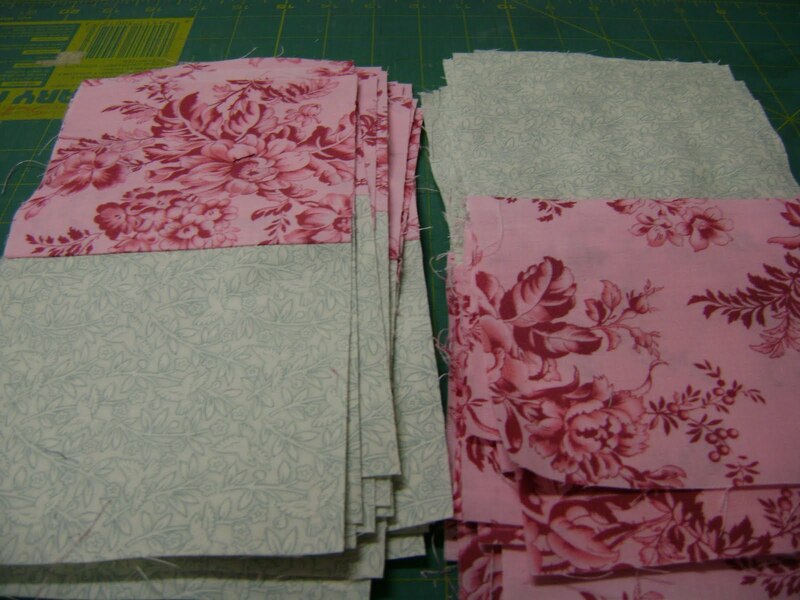 I should tell you that pressing is a very important step in the creation of this quilt. 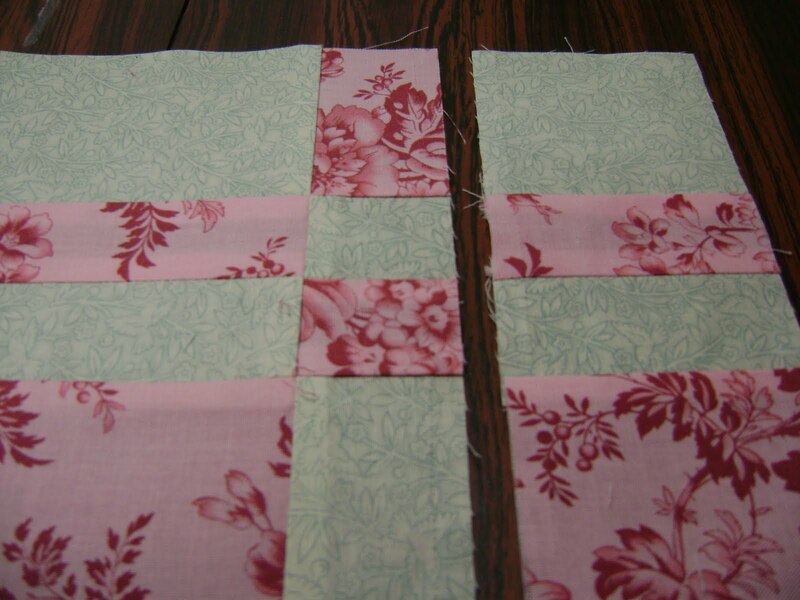 You must press correctly at each step to get perfect piecing at the corners. If it isn’t pressed the right way you will get fabric warts at the corners. 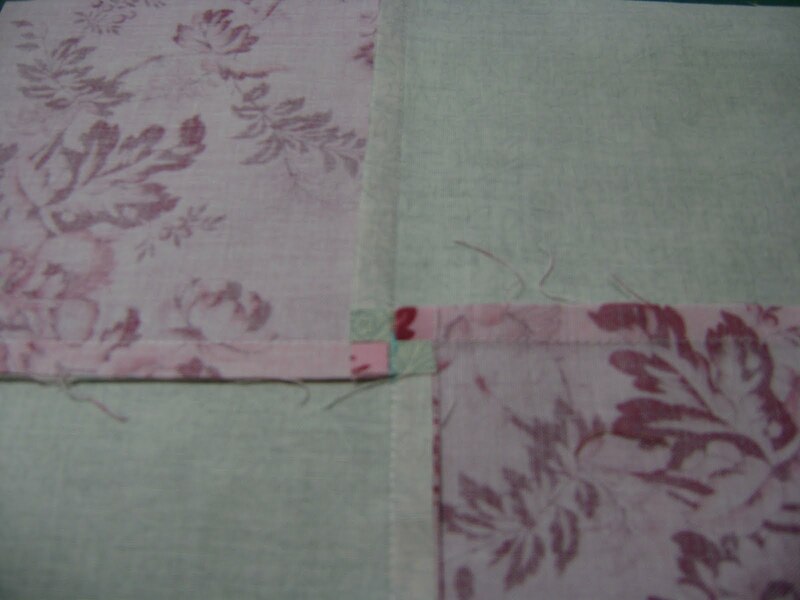 Now turn the sewn back blocks a quarter turn and cut down the middle again. Like this. Flip the stack on the right like this. 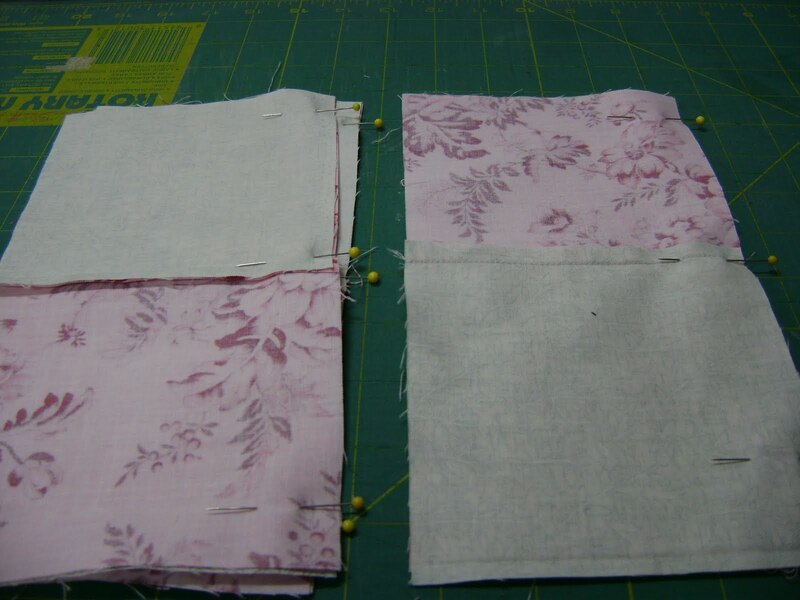 Pin two halves together and sew. I always pin my pieces together before sewing. 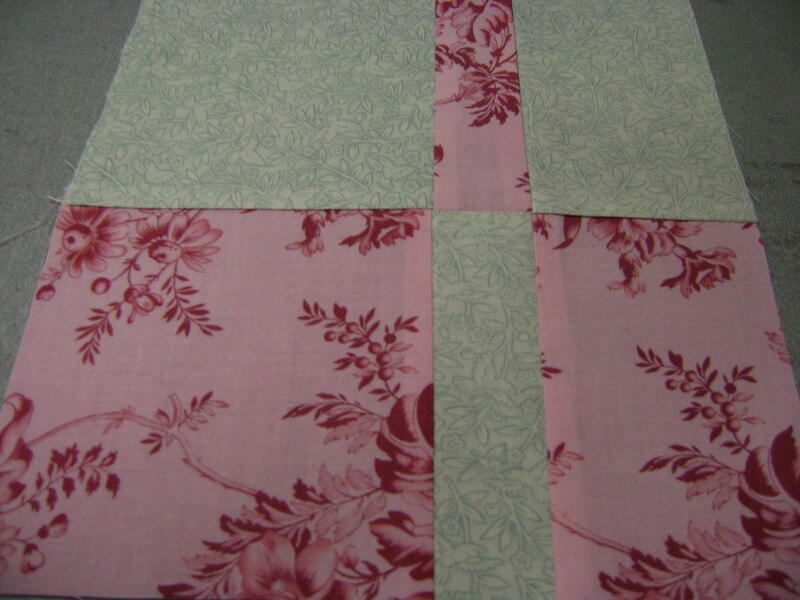 For this quilt, I match the center seams very carefully and pin there first. If I’ve done this correctly the seams will lock together because they are now pressed in opposite directions. Next, I pin together each end. Ok, another bit of caution here. Be sure you sew the blocks back together correctly. If you get one turned wrong, as seen in this photo, it won’t work. Every time you sew the pieces back together they must be sewn exactly the same. So here they are pinned and ready to sew together again. Ok, this next step is done so that the pressing can be done correctly and to give you very flat intersections. You see where there is a seam going horizontal and one going vertical? 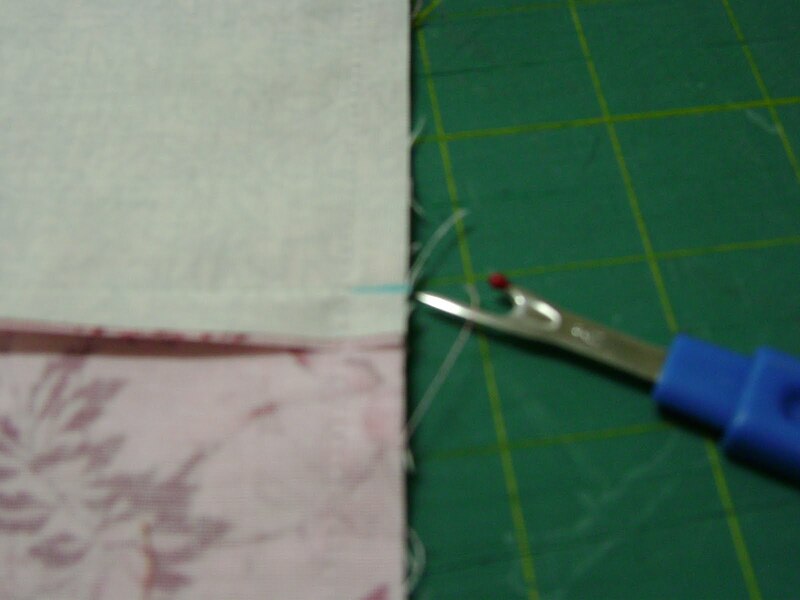 You want to frog out the stitches of the previous seam (the horizontal one) just to where it meets the newest sewn seam. I colored this with a blue marker so it would show up on camera. With my machine the picking out is only three stitches. You will now press the seams one side up and one side down on the back. This forms a tiny four patch at the seam intersections on the back. Isn’t that cute? Turn the block over and press again. Feel the intersection with your finger. It’s very flat. No wart. Now you will cut the block again. This time measure from the center seam over to the right 1 1/2″ for the cut. If you are left handed you may want to cut on the opposite side for all the cuts. Flip the cut piece on the right around so that the dark is next to the light and pin together being careful to match the center seam so it locks. 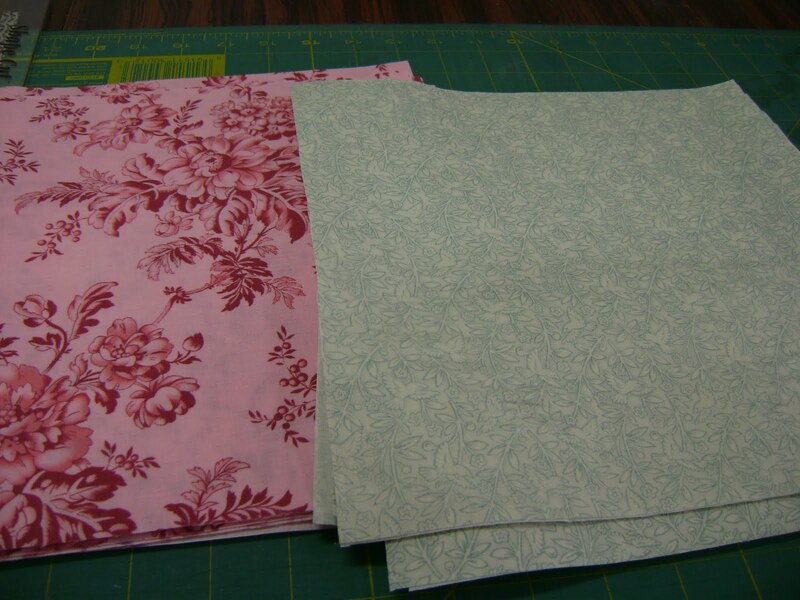 In this picture it looks like I pinned a dark to a dark but that’s only because the piece underneath is just 1 1/2″ wide. 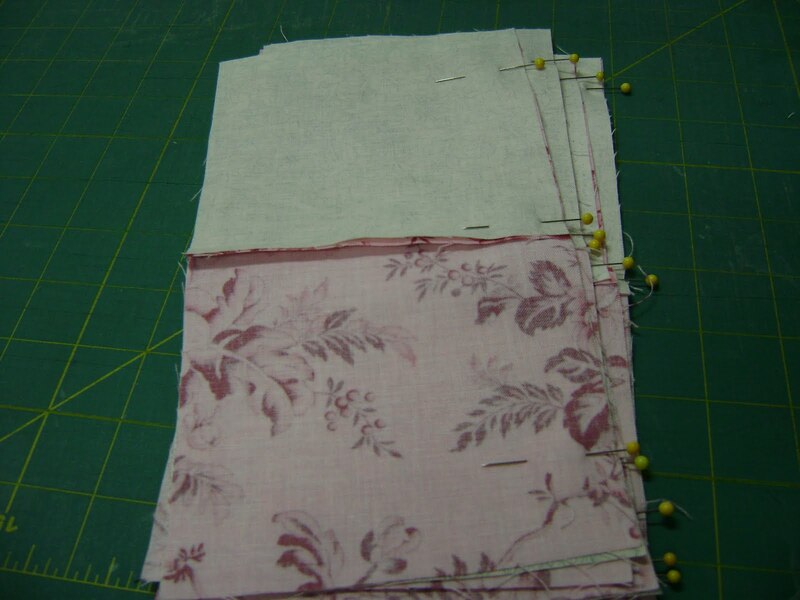 Once again you are going to frog out the previous stitching just until it meets the newest sewn line and press the seams in opposite directions. Now you have two tiny four patches on the back. 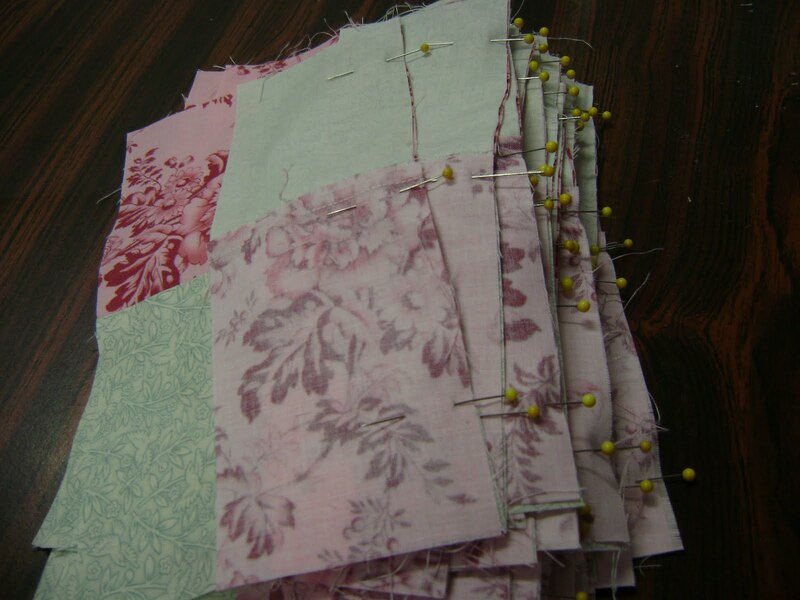 You will repeat this step of frogging and pressing for every seam you sew. I won’t bore you by repeating it each time. Your block should now look like this. 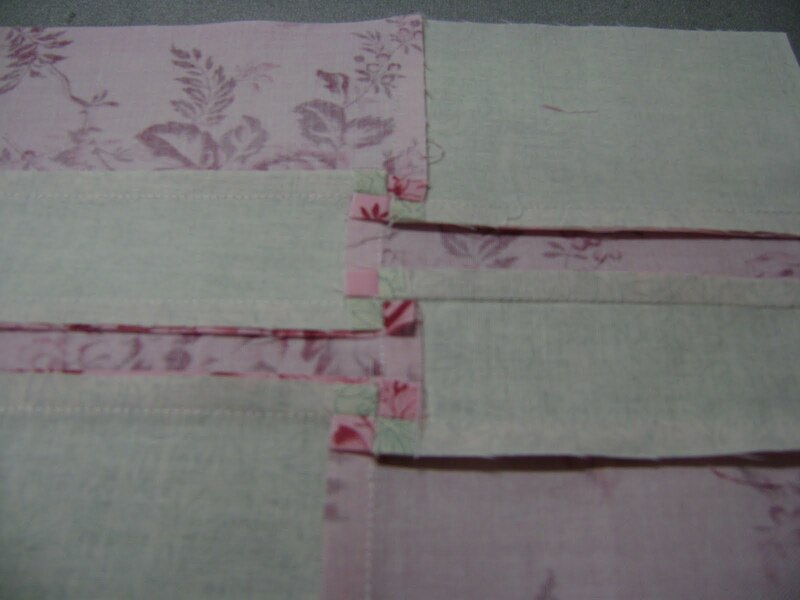 Now you are going to turn the block 180 degrees so the newest sewn seam is now on the left of the center seam. 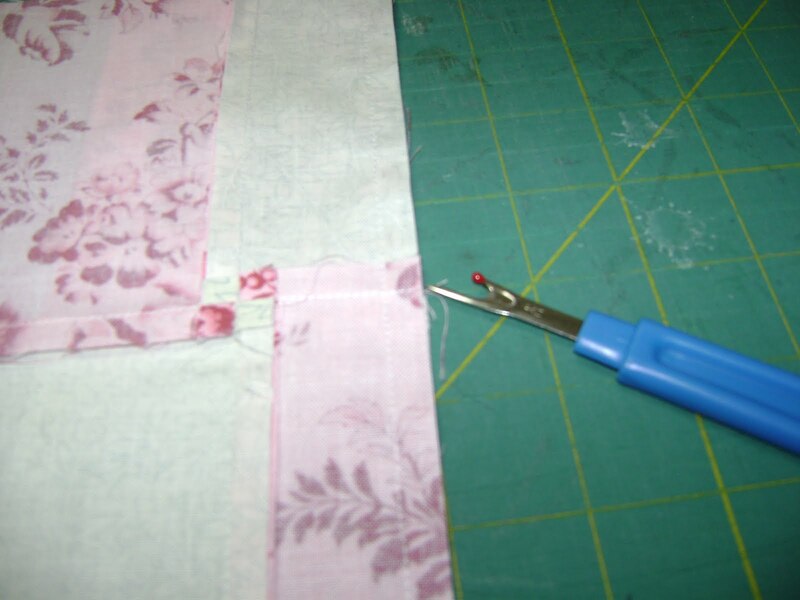 Measure from the center seam 1 1/2″ to the right and cut again. Flip the cut off pieces so that you have a dark next to a light. Pin together being careful to lock the center seams first and sew these back together. By now you can see that you are getting a pretty good collection of four patches on the back. Ok, now you will need to turn your block so that you are cutting across all the previous seams. 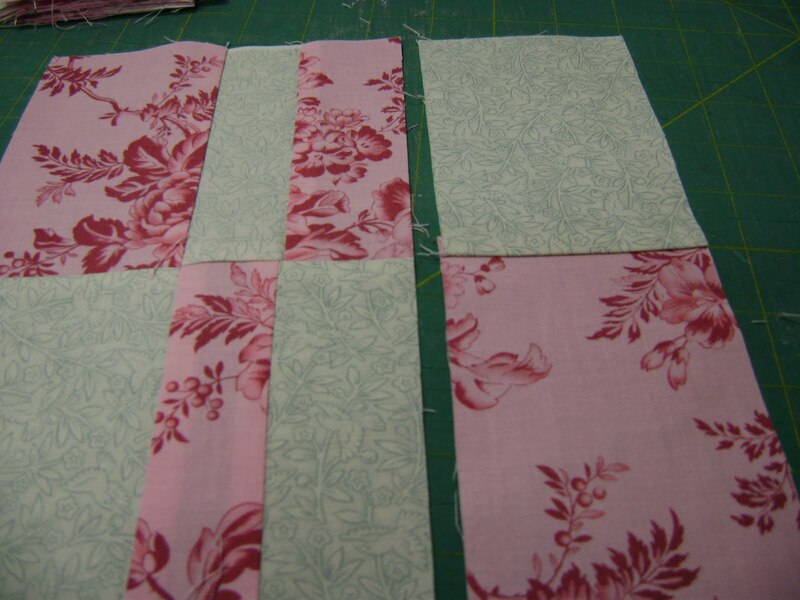 measure from the center seam over to the right 1 1/2″ and cut. Like this. Flip the cut off pieces so that dark is next to light and pin together. 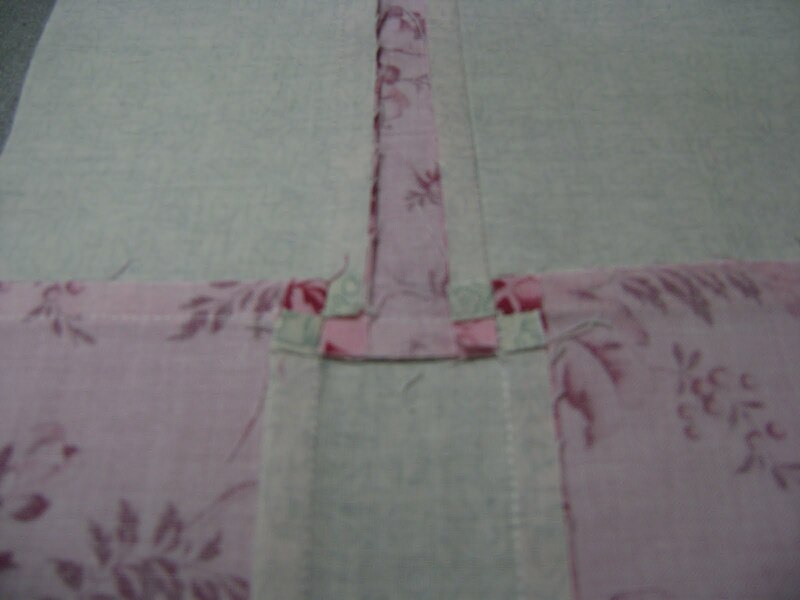 Be careful to match up all your seams so they lock together. I find it easiest to start with the center one and move out. Sew these back together and make your tiny four patch on the back. Take a look at the tiny four patches now. See how I continue to press the seams in opposite directions? 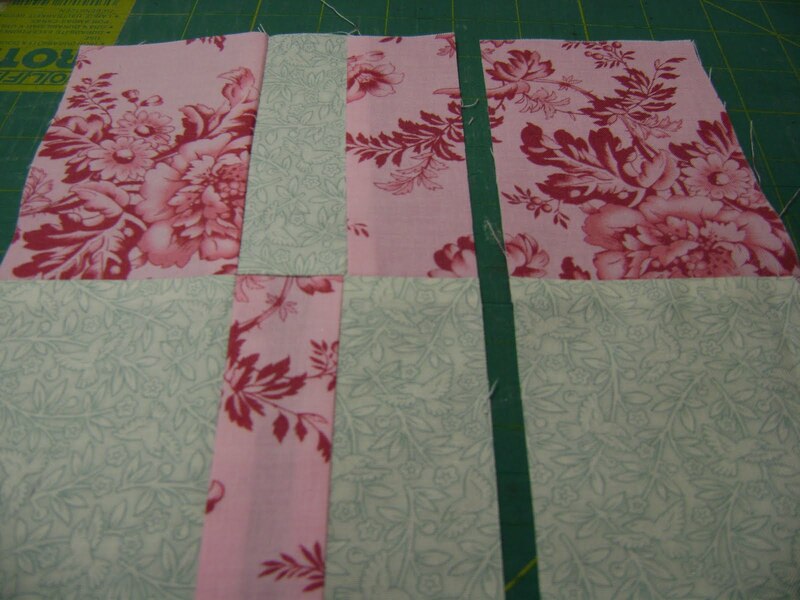 Not one fabric wart in these blocks. Now you are going to turn the block 180 degrees and cut 1 1/2″ from the center on the opposite side. This should be opposite the last seam sewn. Be careful not to cut the wrong side. Flip the cut piece around, pin locking the seams, and sew back together. Oh look, now there are several tiny four patches on the back. Ok, this is what your block should look like now. A four patch in the center and squares in the corners. 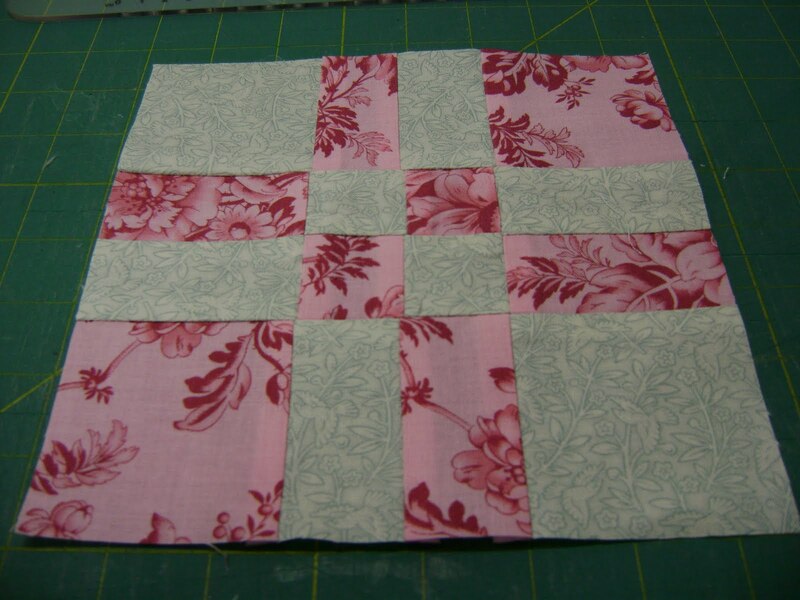 If necessary, square up the blocks before sewing into rows. 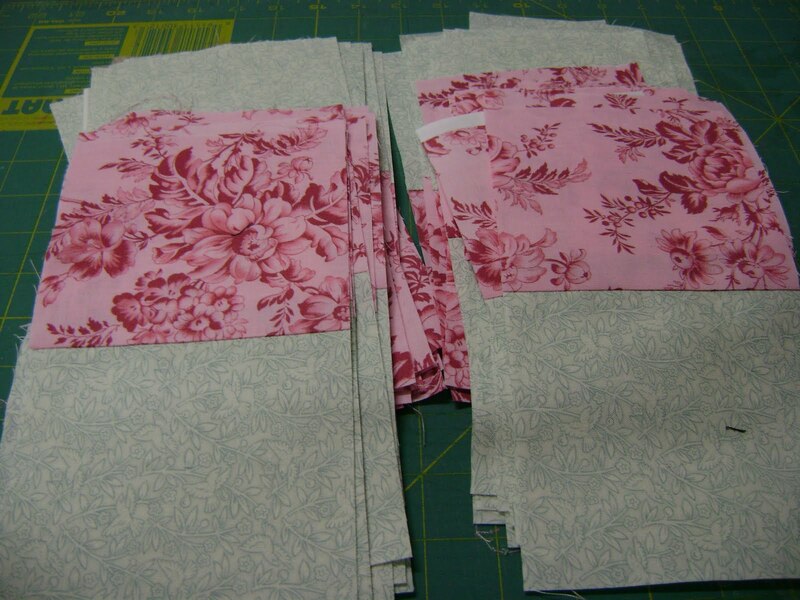 Sew all your blocks together and you’re done. I sewed them in 5 rows of 6. Oh? You thought you could stop making tiny four patches? 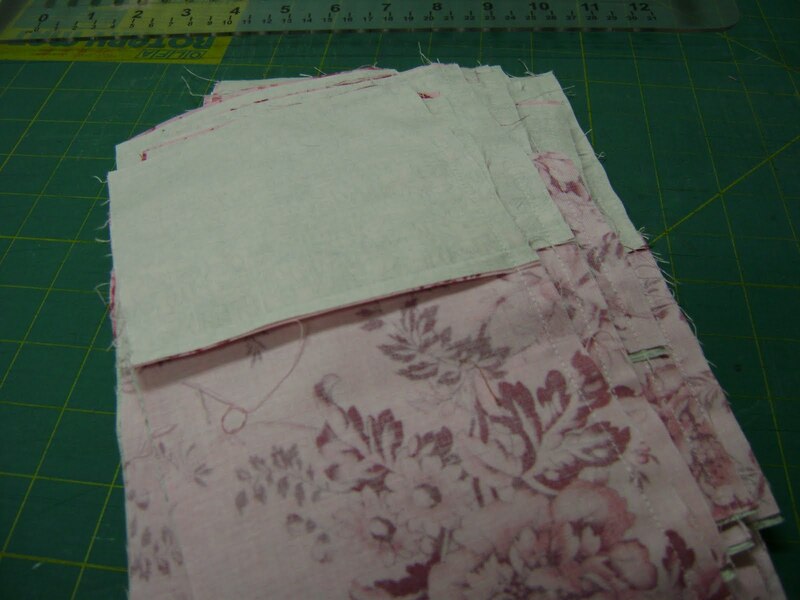 Well, to avoid any fabric warts…. 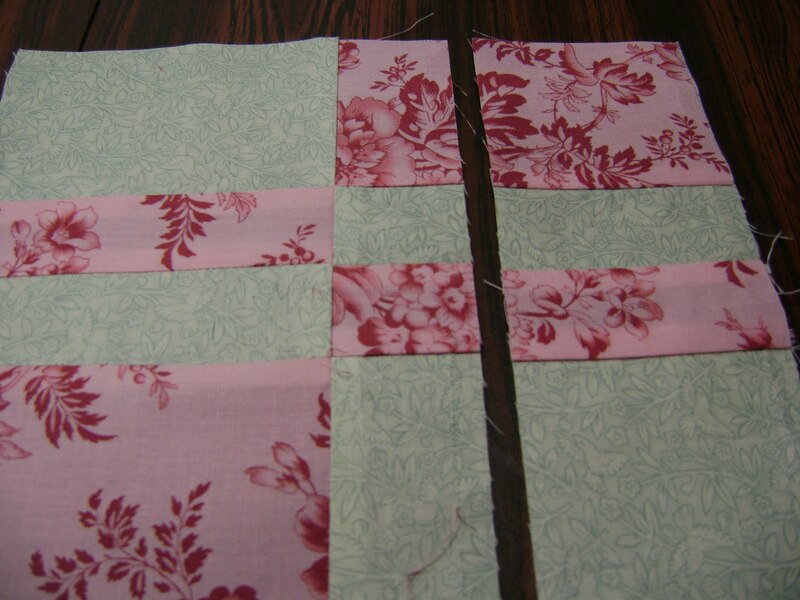 lock all the seams for each row then do the pressing the same as you did for creating the blocks. Ta Da! A finished charity quilt top. Now do I put a border on it to make it larger before quilting? Maybe, maybe not. I’ll decide that when this top gets it’s turn on the quilting machine. If you create this quilt I really do want to hear from you. Especially if anyone is interested in doing more backwards piecing. Oh Anita! You have done it again! how clever. 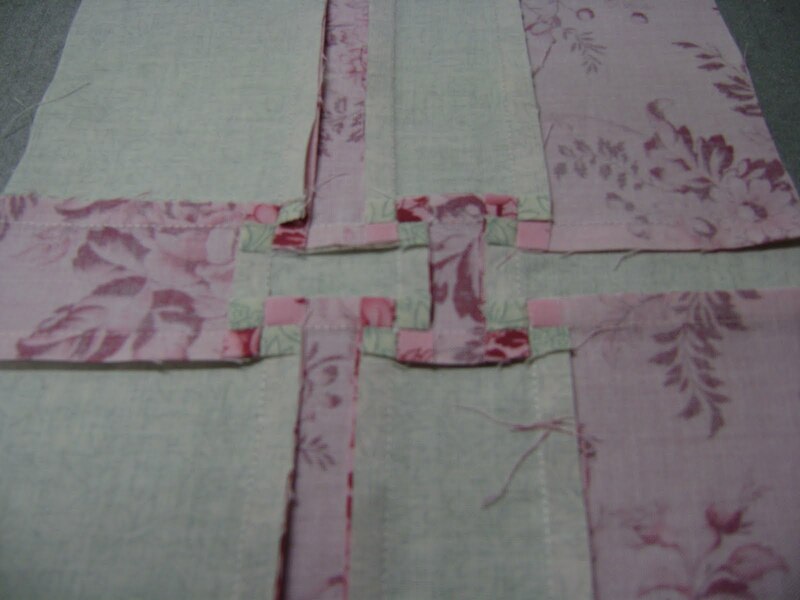 I have quilted (and pieced) for many many years, but have never tried this. It is a great idea. Your pictures and instructions are great. I will let you know when I try this. I think I will take another of your suggestions and make up a kit to take on a retreat I am going to in March. Love the quilt, Anita. It will be fun to make for the newest grandbaby expected in April. Thanks for good instructions and pictures. Am I correct in figuring that the unfinished size of the block is 8 1/2″? Anxious to see more of your “backward” block designs. Hope you get to feeling better soon! The flu bug is no fun. 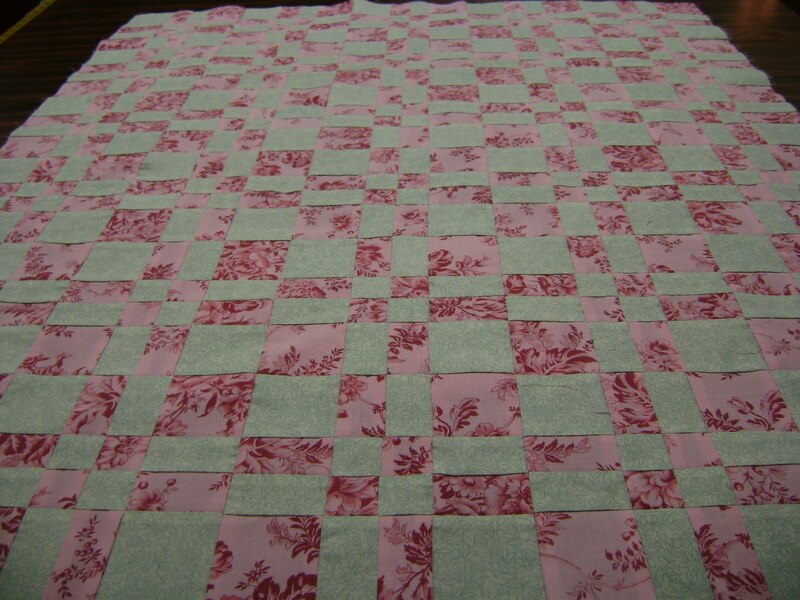 This entry was posted on January 30, 2010 by Anita in Quilt piecing patterns.